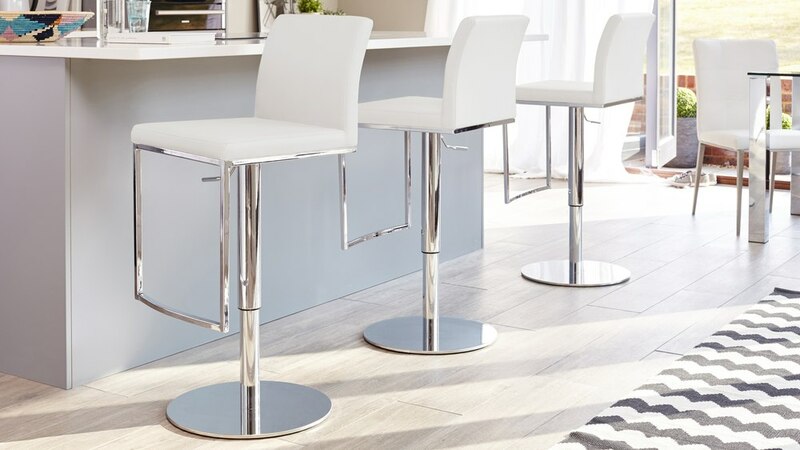 Ideal for an open plan dining space, living area, or combined kitchen and dining area, the Verona Chrome Gas Lift Barstool will instantly add a bright and modern feel to your home. We have taken the signature frame detail from the Verona Dining Chair and developed this into a bar stool to create a wonderfully coordinating set. Whether you're having breakfast with the family or inviting your friends round for a drink, the Verona bar stool will provide a very comfortable and smart looking setting. The height of the Verona's backrest will sit comfortably at your lower back. The benefit of this height is that it's high enough to offer some lower back support, but not so high that it breaks up a nice open plan space. The chrome frame of the Verona follows right around the seat base and back. This give these bar stools a 360° appeal, as you can still see this stylish design feature both when the stools are tucked neatly under the bar and when they are in use. We use the very best components to make our bar stools. For the gas lift, we've used a European standard top quality mechanism that is independently tested and engineered for performance. This means the Verona bar stool has been designed to stand up to continued everyday use, making it long lasting and durable. The main benefit of having a gas lift bar stool rather than a fixed height seat is that you have full flexibility over the height. 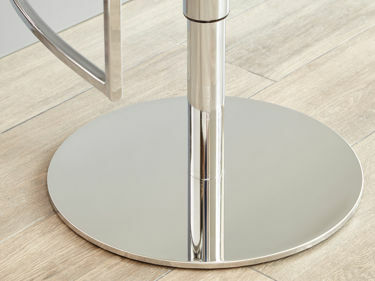 There is also no need to worry about finding the exact sized stool to fit your bar. The Verona bar stools can be fully adjusted up or down to cater to your needs, really optimising both the practicality and comfort factor. The majority of bar stools on the market have a hollow tulip base. However, all of our bar stools have a solid cast iron base that is then in wrapped in chrome plated steel. This not only gives the bar stools a more defined and sleek appearance, but also gives the stools a reassuring weight and quality, eliminating the wobble that can be associated with lower quality barstools. The seat of the Verona is made from faux leather. 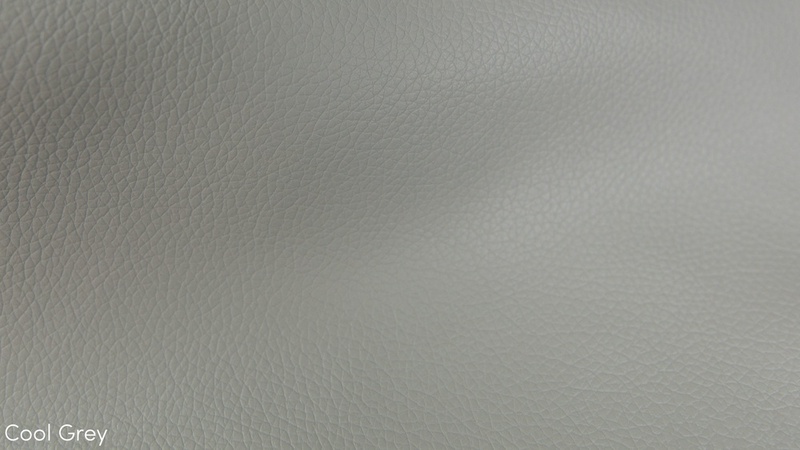 Faux leather is a great material choice for something as often used as a bar stool as it is durable and very easy to clean and maintain. 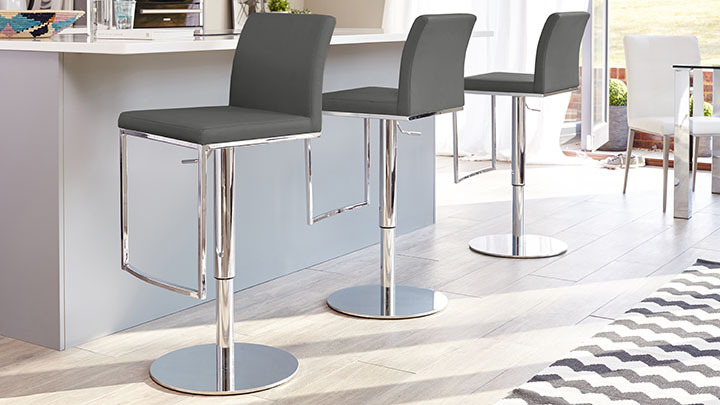 For a truly sleek and coordinated look throughout your dining or kitchen area, we suggest pairing these bar stools with the Verona Dining Chair. 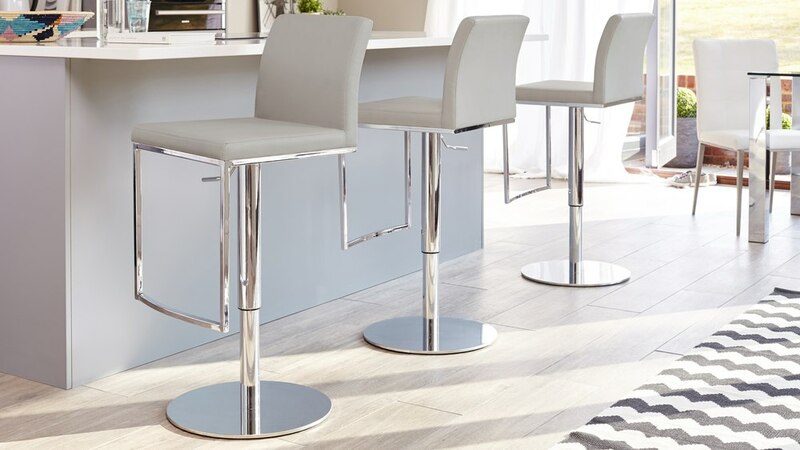 Chrome and gloss pieces are also great to place alongside these modern bar stools to really accentuate their clean and contemporary look. Chrome Frame and Continuious Clean Lines. 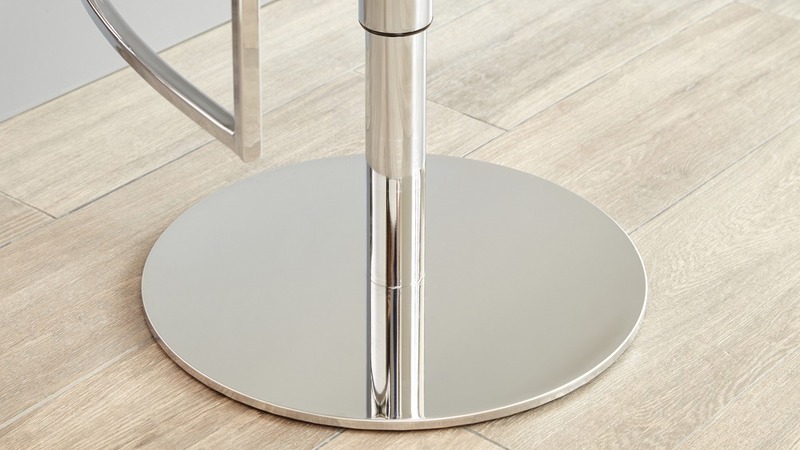 The chrome frame of the Verona bar stool is one seamless line that loops into a footrest and follows around the back of the seat. 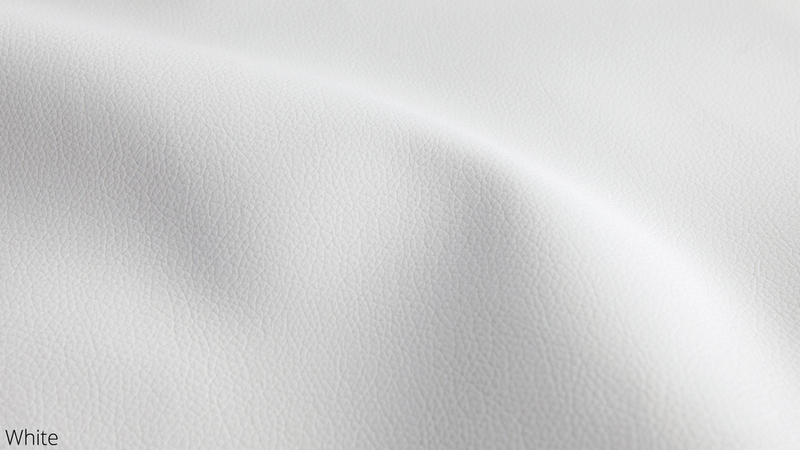 This unbroken line gives the Verona such a sleek and fluid look. The way the chrome frame follows around the base and back of the seat adds a quiet detail as even when the stool are tucked in at your bar, you still get a flash of the chrome frame running along the back of the seat. The looped footrest coordinates with the Verona’s angular design, while also increasing the comfort factor when seated.